The Lexus Design Award is a big deal. You can tell that as the six finalists who, gathered in a trendy warehouse space at the epicenter of Milan Design Week, talk eagerly about their innovations. The ‘super six’ as we’ll call them have been whittled down from a total of 1,548 worldwide entries from no less than 65 countries. And, on the day the press got to give them a grilling about their inventions, the handful of finalist’s were also due to find out who was going to win the 2019 Lexus Design Award just a few hours later. To be honest, all six of the finalists are winners. Just to get this far in a competition that has grown in stature since it was first launch back in 2013 is a huge boost for these innovators. Inventing things is one thing, but getting them to market is incredibly difficult, particularly when you’re often doing it under your own steam. They all seem unanimous is stating that the support from Lexus has been invaluable. 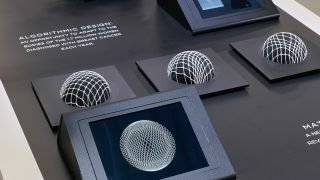 However, what adds another level of excitement to the 2019 Lexus Design Award showcase is the diversity that’s on offer. There’s the groundbreaking Algorithmic Lace bra, and Arenophile, which seeks to find a new purpose for desert sand. Flood mitigation housing project Baluto is clever, while Green Blast Jet Energy, which harnesses wasted jet engine energy to produce power, seems really promising too. Hydrus, meanwhile, seeks to minimize the effects of offshore oil spills whilst Solgami is an origami-inspired blind system for windows that can generate electricity and improve illumination. It’s a real mixed bag. And, perhaps surprisingly for a competition started by a car manufacturer, there isn’t much here to do with the automotive industry. In an exercise that looked more like a speed dating event than a chance to talk to inventors about their ideas, TechRadar got to work our way around the warehouse space talking to most of the creators. We kicked off by meeting Lisa Marks, from the USA. Her idea? That Algorithmic Lace bra. This, in essence, is a bespoke bra made specifically for women who have undergone a mastectomy. It’s been custom crafted, she tells us, using a new technique involving algorithmic patterning to make three-dimensional lace. The idea is quirky, but undeniably clever. What’s most intriguing about the story is that Lisa, an industrial designer, has managed to blend craft research with algorithmic design in the first place. Her thinking suggests a real community-based mentality; she wants to promote sustainable methods to help craft communities. Creating lace by hand and combining it with tech seems a bit strange, but it all starts to make sense as she elaborates on the concept. The idea is so impressive it ends up bagging Lisa the 2019 Lexus Design Award a hour or so later. The good vibes continued as we moved on to Ben Berwick, an affable Australian who’s developed Solgami. This fascinating invention uses origami geometry to give apartment residents a closer connection to their external environment. It’s basically a neat twist on the window blind, which helps to both illuminate poorly lit urban spaces more efficiently as well as generating electricity. It seems to be one of those ideas that, you think, must surely have been done already. Except it hasn’t. Given the amount of windows that exist around the globe, the invention has the potential to be huge. Berwick developed the concept initially while he was doing a Master’s degree in engineering at the University of Tokyo. It is, however, an invention that could be rolled out anywhere. Ben cites hospitals as the perfect place where he could take the idea next. We also met Dmitriy Balashov, a Russian entrant who specialises in industrial design. His idea is equally impressive when you consider the potential. Green Blast Jet Energy is an innovation that makes it possible to harvest the otherwise wasted energy of aircraft as they take off. Considering major airport hubs around the world have jets taking off as frequently as every minute it seems like this invention has serious potential too. Of course, in a way having the idea is the easy bit. Jumping through the many logistical loops and making an invention commercially viable is something else entirely. It’s an issue that LDA judge John Maeda thinks is perhaps the biggest part of the challenge. Before he became a technologist, Maeda started out in venture capital, so he knows a thing or two about finance. Raising it for unorthodox ventures isn’t easy he explains over a coffee. But, being in a competition like this certainly helps open a few doors along the way.